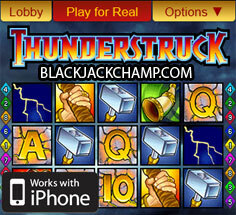 Mobile Thunderstruck slot, from Spin 3, is a 5-reel, 9-payline, 5-coin game where you meet Thor, the legendary Nordic God of Thunder as he wields Mjölnir, his ultra-powerful magical hammer. 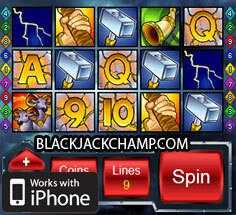 Symbols in this fun mobile slot include gods, heroes, weapons and drinking horns along with other items described in Scandinavian mythology. 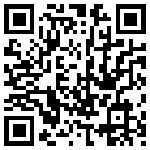 The background colors are crisp, the sound effects go well with the overall theme, and the game is extremely playable. 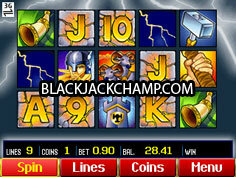 It’s fun to play this mobile slot at your own convenience, whether on the beach, at the office or at your niece’s school recital! 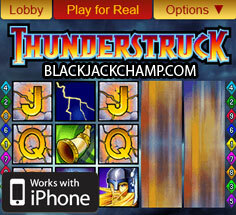 There are many ways to win loads of cash in Thunderstruck mobile slot with additional game features found in traditional and online slot machines. 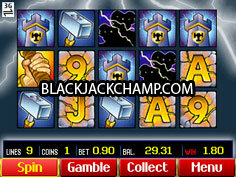 This slot includes a Wild Multiplier symbol and a Scatter symbol. 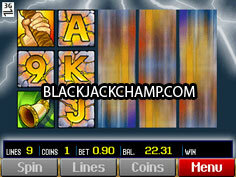 There are also some good ways to make money during the bonus features which offer lots of Free Spins. 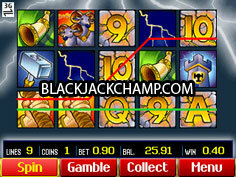 Another bonus feature which I know everyone will love is the Gamble option which allows you to double or even quadruple your winnings!